ALL OTHER RELIGIOUS DOCUMENTS IN EXISTENCE? PLEASE , click on this handy little map and show me where you are visiting from. You can see where I live, also! Courtesy of The Virtual Bible Museum. The Bible (The Word) as we commonly know it consists of sixty-six books, which were originally written in three ancient languages. Most of the Old Testament was written in ancient Hebrew, with parts of Daniel and Ezra written in Aramaic, a sister language to Hebrew. The New Testament was written in an ancient Greek known as Koine Greek. Exodus 24 tells us that Moses wrote the first portions of the Bible, specifically it was called The Pentateuch, standing for the first five books. Through Joshua and Samuel the rest of the Old Testament was written down (I Samuel 10:25) Men designated to make copies of the original manuscripts as they deteriorated were called scribes. They followed the instructions in the Talmud, a book of jewish law, in the copying from soaking the animal skins (parchment) in water and lime to writing with a special ink and in a special font, reducing the chance of misreading by future scribes. The scribe had to sing and say aloud each word as he copied it letter by letter. He had to bathe each day before he began copying and when he came to God's name he had to bathe again. Following the completion of a page he totalled up the numerical values of the letters and compared it to the copy. If it did not match exactly, he destroyed it. It then had to be reviewed by three rabbis. It was reviewed again after 30 days to see if it was satisfactorially aging. So we can be sure that we have "exact" copies of the original manuscripts due to the extraordinary respect and care the scribes used. In 1947 this was documented when a shepard boy found the Qumran Caves, pictured below. This is where the Essenes, a jewish sect considering itself a righteous remnant, hid portions of scrolls of all books of the Bible, except Esther, in clay pots, pictured below. When examined and compared with the copies of the original scrolls, available at the time, virtually no differences were found. Only very slight, insignificant grammatical-type deviations were found. Thus, we have further proof that the Bible that we believe in is the same in context as those books penned by both the old and new testament prophets and apostles. Here is one of the most concise summaries of Bible authenticity that I have seen, including a nice table! It is courtesy of Greg Denham's site (brother of my current pastor, Wes) at Calvary Chapel of Auburn . BUT IS THE BIBLE RELIABLE? There are basically three tests historians use to analyze a historical document. The first test is known as a �bibliographic test� which studies how the original text reached us. If the document in question is not an original text but a copy of that text, then certain questions are asked to determine its authenticity. One of the most important questions to answer is, �What was the space of time between the original text and the time a copy was written? Below is a chart that shows the results of this test on notable historical writings and how they compare to the text in the New Testament. Aristotle wrote his poetics in 343 B.C. The first copy of Aristotle�s writings was made in A.D. 1100. That means there was nearly a 1400-year gap between the original documents of Aristotle�s first copy of writings; and we only have 5 copies! Plato�s work was written in 400 B.C., and the first copy was written A.D. 900. That means there was a 1300-year span between those writings with seven copies of his work in all. Julius Caesar�s work was written in 100 B.C. and its first copy was A.D. 900, which is a 1000-year span, and we have 10 copies. Finally, 100 B.C. was when Caesar�s work was completed. 1000 years later, in A.D. 900, the first copy was completed. We have 10 copies of this work. The New Testament on the other hand was finished by A.D. 100. Its first copies were available immediately during the first century A.D. written on papyrus, the writing material of the first three centuries A.D.
Today, over 5500 copies of the original text in the Greek language are available for our study and use. Another 1000 copies are in primary languages. Over 10,000 copies are in Latin � all completed by hand before the invention of printing. The second test is the �internal test� which examines the accuracy of the text itself. One way to accomplish this is to identify any witnesses of the information in the text that is in question. How close, in other words, were the witnesses geographically and chronologically to the text that is under review. In regard to the New Testament, individuals who were either eyewitness to the events recorded, or who had personally interviewed witnesses of the events recorded in Scripture wrote it. In fact, for a book to be considered �canonical,� it had to be written by a prophet or an apostle or one who had a close relationship and was under the guidance of an apostle (Mark to Peter, Luke to Paul). Only those who had witnessed the events or had recorded eyewitness testimony could have their writings considered as Holy Scripture. The gospel writer, Luke, begins his narrative, �Most honorable Theophilus: Many people have written accounts about the events that took place among us (Luke 1:2).� They used as their source material the reports circulating among them from the early disciples and other eyewitnesses of what God had done in fulfillment of his promises. The New Testament writings were in circulation in the generation that they were penned. This means that there was ample opportunity for the Scriptures to be challenged or refuted! Furthermore, the witnesses of the life of Jesus and many of the authors who penned the New Testament were martyred for their faith. Granted, dying for a belief is nothing new, nor is it necessarily convincing that the cause is right. After all, people have given their life for causes both good and bad throughout history. However, no one knowingly gives his or her life for a lie! This is what made the deaths of many of the original followers of Christ so powerful. The apostles knew whether or not Jesus had resurrected! The fact that they were willing to give their lives in a martyr�s death tells us they were convinced that Jesus had conquered the grave and was alive! 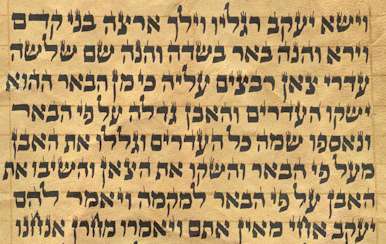 The following is a copy of a portion of a Hebrew Torah scroll that is over 300 years old. Go Here for the entire teaching! All translations of Scripture, all of them, are based on ancient sources�ancient sources that have been discovered in libraries throughout ancient times, treasures for those libraries. They have been discovered, they have been studied, they have been analyzed for their accuracy. They have been compared by the most fastidious, dutiful, thoughtful, careful scholars through the centuries so that I can say to you, unequivocally, the Bible you hold in your hand, if you have formal equivalency, an actual translation, I can assure you, you have an accurate�an accurate Bible. The Holy Spirit, who is the author of Scripture, inspiring every writer of Scripture, is also the preserver of Scripture. Supernaturally, He moved on the writers without disrupting their own words and thoughts and ideas so that they wrote exactly what He wanted them to write. He moved on the preservers to make sure that the Scripture stayed pure for history. The printing press didn�t show up till around 1500. Everything up to that time was copied by hand. Scribes understood the seriousness of what they did. There are some amazing stories about scribes, listen to this, copying down the Hebrew Old Testament who wrote one letter, left, and took a bath. Came back, wrote another letter, left, and took a bath, and did that until they had written the whole Old Testament. Sort of ceremonial cleansing to remind them after every letter of the importance and the sacredness of what they were copying. At first, they were copying the original texts, written by Moses, written by David, written by Isaiah, written by Paul, written by Paul, James, Mark, Luke. They knew what they had in their hands and they copied it carefully because they understood it was Holy Scripture. Now, today, we have�let�s just take the New Testament cause that�s where we�ve been working, we have twenty-five thousand ancient manuscripts of the New Testament, twenty-five thousand. You say, �Is that all there�� Oh no, I couldn�t even begin to tell you how many there were that disappeared over the centuries, but there are twenty-five thousand that are extant, that now exist. This is an abundance of manuscripts by which we can compare them all and come to the accurate understanding that we need. Such an abundance shows how the Holy Spirit preserved everything. 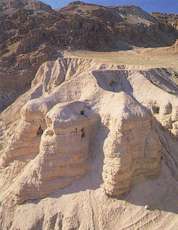 That was the importance of the Dead Sea Scrolls, Old Testament manuscripts. When they were found, they were written before the time of Christ and they are matched to the translations we have today, showing how the Holy Spirit preserved Scripture. Nothing�nothing in ancient literature, even comes close to the mass of manuscripts that we have on the New Testament. And what they demonstrate is the uniformity and the consistency. There are, as I said, twenty-five thousand ancient manuscripts. There are five thousand, six hundred or so Greek manuscripts and they go way back. We have Greek manuscripts from the second century, from the third century. Our Lord lived in the first century. There is a manuscript called P-52 and they�re numbered and named according to the people who found them, or the location, or something like that. This one called P-52 has parts of the gospel of John and it dates from 100 to 150 and John was living in the nineties. Somebody copied an original, most likely, or a copy of an original, very near the original. There is another papyrus, they were writing on papyrus so they�re called papyri, there�s another one called the Bodmer Papyri in which we find John and Luke and it dates from 175 to 225. And then there�s the very famous papyrus called the Chester Beatty papyrus that has all four gospels and the book of Acts and it dates around 200. They go way back. Here�s the amazing part. There probably shouldn�t be a lot of manuscripts from those early years. Why? Because second century in particular and the third century, for sure, was a time of immense Christian persecution, and an effort to stamp out Christianity by the destruction of Christians and Christian scriptures. But the Lord preserved these ancient texts, copies of those very close to the original. Once you get into the fourth century, around 325, or so, you get Constantine making Christianity legal. The persecution ends and now manuscripts proliferate. They�re everywhere. And so by the time you pass say 325, the Council of Nicea, we begin to see manuscripts in abundance. The two most important ones, one is called, it�s a Codex, this is called a Codex because it is a bound volume, rather than a scroll. The first one that is very important is called Sinaiticus and it�s about 350 and it�s the whole New Testament. The second important one is called Vaticanus, 325 and it�s the whole Bible. By the way, both Sinaiticus and Vaticanus end Mark at verse 8. We also have eight thousand ancient copies of the New Testament in Latin called the Vulgate. And the Vulgate dates from 382 to 405. We also have 350-plus copies of the Bible in Syriac that goes back to the 200�s. If I�m belaboring this a little bit, I�m going to tell you why. We have all these ancient manuscripts that when compared all say the same thing. The early church fathers, for example, before 325 because there was the Council of Nicea in 325, they�re called the ante nicene fathers because they were before Nicea, the early fathers in the 200�s and 300�s, if you just read�there were these guys writing all kinds of theology, and all kinds of biblical study material, if you take the church fathers prior to 325, there are among those fathers about 32 thousand quotes from the New Testament. There are so many quotes from the New Testament among those fathers in the writings of the fathers, which we have, which are held in libraries, that we can reconstruct the complete New Testament from nothing but the writings of the fathers. That�s another source to find what the New Testament said in ancient times. The writings of the early church fathers also confirm the accuracy of the gospels. There are over nineteen thousand quotations from the gospels in the writings of the fathers. So whether you�re reading a Greek manuscript, a Syriac Bible, or whether you�re looking at a Latin Vulgate or whether you�re reading a quote from a church father, it is crystal clear that they all had the same thing. They would be reading essentially in their language what you�re reading today in yours because yours is drawn from those ancient manuscripts. Now let me give you something to compare with all that. The second most common ancient document in the manuscript world is Homer�s Iliad. Remember that when you went to college? You had to read that epic poem called the Iliad by Homer? Next to the New Testament there are more copies of Homer�s Iliad than any other ancient piece of literature. Oh, by the way, there are 643 of them�643, small change compared to twenty-five thousand. And, oh by the way, the oldest one is from the thirteenth century A.D. and Homer wrote in the eighth century B.C. We don�t have anything even close to when Homer wrote. Who knows whether Homer ever said any of that? Another familiar piece of literature to a student of history is the Golic Wars, Caesar fought Golic Wars. He wrote the Golic Wars, the history of the Golic Wars in the first century B.C. There are ten existing manuscripts of that, the oldest one is a thousand years after Caesar wrote. Some of you may have heard of Herodotus, the Greek historian. He wrote history. In fact, Herodotus could be the father of historians, he was the son of the first historian. He wrote in the fifth century before Christ. We have eight manuscripts of Herodotus� history and the earliest is 1300 years after he wrote. There�s another one. Because I studied European history and have always been fascinated by this, I�m even reading something about it now, the history of the Peloponnesian war written by Thucydides, we have eight manuscripts of that, the earliest is 1300 years later. Do I need to go on? Nobody bothered to protect those. Nobody bothered to preserve those. But, boy, did they work hard to protect the Word of the living God. They knew what they had. With so many accurate manuscripts, you can know with no hesitation that the Bible you hold in your hand is a true English translation of the original autographs, as they�re called, preserved accurately. One of the scholars that I�ve studied in years past, is a man named A.T. Robertson. You�ll see his name connected to matters regarding biblical scholarship. A.T. Robertson says, �The vast array of manuscripts has enabled textual scholars to accurately reconstruct the original text with�listen to this�more than 99.9 percent accuracy.� That�s pretty good. More than 99.9 percent accuracy. What�s so amazing about this, these are all hand copies�hand copies. Now you say, �You mean, in all of that there are no errors?� Oh, I didn�t say that. They made errors. They put in a wrong word, put in a wrong spelling, left something out, occasionally they even tried to clarify something, some of these scribes. But guess what, we have so many manuscripts, we know when they�re doing that. We know when we�re doing that. Plus, if something shows up in a later manuscript, and it�s not in any of the earlier ones, we know it was added later. It isn�t brain surgery. As stated previously, the Hebrew Bible has come down to us through the scrupulous care of the ancient scribes who copied the original text in successive generations. By the 6th century the scribes were succeeded by a group known as the Masoretes, who continued to preserve them for another 500 years in a form known as the Masoretic Text. Babylonia, Palestine and Tiberias wer the main centers of Masoretic activity; but by the 10th century the Masoretes of Tiberias, led by the family of ben Asher, gained the ascendancy. Through subsequent editions, the ben Asher text became in the 12th century the only recognized form of the Hebrew Scriptures. Daniel Bomberg printed the first Rabbinic Bible in 1516-17; that work was followed in 1524-25 by a 2nd edition prepared by Jacob ben Chayyim and also published by Bomberg. The text of ben Chayyim was adopted in most sbusequent Hebrew Bibles, including those used by the Kng James translators. It was used for the first 2 editions of the Biblia Hebraica, by Rudolph Kittel, in 1906 and 1912. Paul Kahle, in 1937, published a 3rd edition of Biblia Hebraica, based on the oldest dated manuscript of the ben Asher text, the Leningrad Manuscript B19a (A.D. 1008), which Kahle regarded as superior to that used by ben Chayyim. For the New King James Version the text used was the 1967/1977 Stuttgart edition of Biblia Hebraica, with frequent comparisons being made with the Bomberg edition of 1524-25. The Septuagint (Greek) Version of the Old Testament and the Latin Vulgate were consulted. In additon to referring to a variety of ancient versions of the Hebrew Scriptures, the New King James Version also draws on the resources of relevant manuscripts from the Dead Sea caves. In the few places where the Hebrew is so obscure that the King James followed one of the versions, but where information is now available to resolve the problems, the New King James Version follows the Hebrew text. Significant variations are recorded in footnotes. The original manuscripts of all the New Testament books, as far as is known, have been lost. Copies began to be made for other churches and copies of copies, generation after generation, as the older ones wore out. Papyrus, the common writing material in use, was made of slices of the water plant that grew in Egypt. Two slices, one vertical, the other horizontal, were pressed together and polished. Ink was made of charcoal, gum and water. Single sheets were used for short compostions and for longer sheets, they were fastened, side to side, to form rolls (30 ft. long by 9 or 10 inches high). In the 2nd century the books began to be made up in "Codex" form, that is modern book form, in which any number of leaves could be put into one volume, with numbered pages. Papyrus was not very durable and became brittle with age or rotted with dampness, and soon wore out; except in Egypt, where the dry climate and shifting sands have preserved for the discovery in our own times an amazing collection of ancient documents. In the 4th century Papyrus was replaced with Vellum, parchment made from skins, which was much more durable and made up in book form. Until recent discovery of the Egyptian Papyri, all known extant manuscripts of the Bible were on Vellum. With the invention of Printing in the 15th century the making of manuscript Bibles ceased. There are now in existence about 4,000 known manuscripts of the Bible, or parts of the Bible, made between the 2nd and 15th centuries. This seems few to us, but it is far more than the manuscripts of any other ancient writings. There is not a complete known copy of Homer earlier than A.D. 1300; nor of Herodotus earlier than A.D. 1000. Here is an update from the "John Hagee Prophecy Study Bible": Over 5,000 Greek, 8,000 Latin, and many more manuscripts in other languages attest the integrity of the New Testament. The Vellum manuscripts now known are called "Uncials" and "Cursives." The Uncials, numbering about 160 and made between the 4th and 10th centuries, were written in large captial letters. The Cursives, made between the 10th and 15th centuries, were written in small running letters linked together. The Uncials, being more ancient, are far more valuable. The three oldest, completest, best known and most valuable manuscripts are: the Sinaitic, Vatican and Alexandrian, which were originally complete Bibles. The Sinaitic Manuscript (Codex Sinaiticus) was found by the German Scholar, Tischendorf (1844), at thet Monastery of St. Catherined on Mt. Sinai. He found 43 leaves of vellum pages with Greek writing, on one trip in a trash can ready to be burned. On a third trip in 1853, he discovered the rest of the manuscript. It was secured by the Imperial Library in St. Peterburg, where it remained until 1933, when it was sold to the British Museum for $ 500,000. Containing 199 leaves of the Old Testament and the entire New Testament (the only ancient manuscript) and was made in the first half of the 4th century. The Vatican Manuscript, from the 4th century, was in the Vatican Library since 1481 and has some fragments of the New Testament missing. The Alexandrian Manuscript, from the 5th century, was in the British Museum since 1627. It contains the entire Bible with some fragments missing. And from the "John Hagee Prophecy Study Bible": There is only 1 basic New Testament used by Protestants, Roman Catholics, and Orthodox, by conservatives and liberals. Minor variations in hand copying have appeared through the centuries, before mechanical printing began about A.D. 1450. Some variations exist in the spelling of Greek words, in word order, and in similar details. These ordinarily do not show up in translation and do not affect the sense of the text in any way. Other manuscript differences, regarding the omission or inclusion of a word or a clause, as well as two paragraphs in the Gospels, should not overshadow the overwhelming degree of agreement which exists among the ancient records. Bible readers may be assured that the most important differences in the English New Testament of today are due, not to manuscript divergence, but to the way in which translators view the task of translation: How literally should the text be rendered? How does the translator view the matter of bibilical inspiration? Does the tranlator adopt a paraphrase when a litreal rendering would be quite clear and more to the point? The New King James Version follows the historic precedent of the Authorized Version in maintaining a literal approach to translation, except where the idiom of the original language occasionally cannot be translated directly into our tongue. The King James New Testament was based on the traditional text of the Greek-speaking churches first published in 1516, and later called the Textus Receptus or Received Text. Although based on relatively few available manuscripts, these were representative of many more which existed at the time but only became known later. In the late nineteenth century, B. Westcott and F. Hort taught that this text had been officially edited by the 4th century church, but a total lack of historical evidence for this event has forced a revision of the theory. It is now widely held that the Byzantine Text that largely supports the Textus Receptus has as much right as the Alexandrian or any other tradition to be weighed in determining the text of the New Testament. Those readings in the Textus Receptus which have weak support are indicated in the footnotes as being opposed by both critical and majority texts. Why do we believe the Bible is accurate? Is it more than just a history book? What makes it different from all other religious books? Over the years we have been asked many questions concerning the accuracy of the Bible. Unfortunately many Christians do not know how to answer these commonly asked questions. So today we are going to examine how God authenticates His message. In the 20th century we have witnessed one of the most remarkable discoveries in recorded history: the discovery that the universe is finite. The implications of this discovery are indeed staggering. Beginning with Albert Einstein in 1903, twentieth-century physicists have demonstrated that space-time and matter had a finite, simultaneous beginning. Prior to this discovery, atheistic scientists and philosophers rested comfortably on the notion that the universe was eternal. Consequently, a universe without a beginning needed no cause, it just existed. However, a universe that has a beginning either created itself (a logical and scientific absurdity) or it was caused to exist by a Being who preceded it. By definition, that means a transcendent Creator, One who exists outside time and space. A transcendent Creator presents some interesting possibilities. Because a transcendent Creator possesses the sufficient means to act in our space-time domain, He also has the capability to get a message to us. The Bible claims to be that message. The Bible authenticates that its text is an extraterrestrial, supernatural message system from a transcendent Creator in several ways. Not the least of which is its scientific accuracy. Throughout the Bible�s text there are highly specific and accurate statements regarding the laws of physics, the nature of our solar system, the planet earth, and its life forms that were penned centuries before this scientific knowledge was discovered by the scientific community. This phenomenon, called scientific foreknowledge, is present throughout the text of the Bible and is a powerful hint of supernatural authorship. Throughout the Bible we find the fingerprints of a supernatural message system. Numerous design features in the Biblical text defy coincidence and demonstrate that the Bible, which consists of sixty-six books, penned by forty authors over thousands of years, is an integrated message system. Because God exists outside our space-time domain, He is able to see, in effect, the beginning and the end of our time domain simultaneously. Consequently, the Bible authenticates that its message is of extra-dimensional origin through predictive prophecy (i.e. by writing history in advance). Astonishing evidence has gradually accumulated in the fields of archaeology, astronomy, physics, and biology which confirm the scientific and historical accuracy of the Bible, the supernatural origin of its text and the fact that it has been preserved virtually unchanged for over two thousand years. No other holy book on planet earth authenticates its message in these ways. For more information on the accuracy of the Bible, and for more examples supporting these claims, check out our series titled The Creator Beyond Time and Space. Skeptics tell us that science contradicts the Bible, but all the evidence of the last 200 years refutes that! The truth is: The only science that really contradicts the Bible is bad science. Students on college campuses today believe that science does, indeed, contradict the Bible because of the teaching of biased and uninformed professors. It is high time Christians learned the truth--that though the Bible is not a textbook on science, every one of its claims about the physical universe is true. Throughout history, whenever the Bible has contradicted science--the Bible is not the one that has had to change! In fact, if one looks at a science textbook from 50 or 100 years ago, it is truly amazing to consider the number of things that were stated as the assured results of science, which are now known to be untrue! For example, 100 years ago it was emphatically stated that the atom could not be split. Yet, we know all too well, as do the survivors of Hiroshima and Nagasaki, that it can be split, and with powerful consequences! No, the Bible is not a science textbook--it is a narrative of God's reaching out to a lost world by redeeming it. However, whatever the Bible says about science, history, geography, or anything else, it is true--precisely because its Author is God. It is our job to be able to explain that to the skeptics who come our way. In 1000 B.C. Solomon said that the earth had at one time been under water, yet vast numbers of scientists believed that to be absolutely untrue until modern times. In 1885 geologists first found evidence that all land surfaces had been under water--and it is clear now that even the oldest and highest mountains show traces of sedimentary origin. In 2000 B.C. the Bible first said that there are channels in the oceans (Job 38:16), but science didn't know that for thousands of years. They thought the floor of the ocean was made up of flat sandy beds like the desert. It wasn't until 1873, when the British ship Challenger examined the sea bottom, that scientists discovered there were vast channels and recesses--some as much as 5 1/2 miles deep and greater than the Grand Canyon--at the bottom of the sea. God asks Job (Job 38) if he had entered into the "springs of the sea." Why, such things were unheard of! Yet Moses confirms their existence 500 years later. Science didn't confirm it until 1930, when deepsea diving equipment allowed them to discover underground rivers and in 1945, when huge springs were discovered in the depths of the oceans. Job 38:25-27 reveals that lightening causes rain! But science didn't agree until 4,000 years later when, in 1964, it was discovered that the discharge of lightening, particularly bolts that travel from the earth up to the clouds, changed the electrical polarity of rain droplets, causing them to coalesce as raindrops and fall to the earth. Tests show that without this electrical charge, these droplets simply ricochet off one another harmlessly. The Bible teaches that all creation ended after the 6th day (Genesis 2:1-2; Hebrews 4:3). That means there was no more matter, energy, heavens, or earth being created after that time. However, through the centuries various writers and scientists contradicted that concept until the 1840's, when Robert Mayer formulated the Law of Mass and Energy Conservation--known as the first Law of Thermodynamics. It states that the total of all mass and energy in the universe remains constant. One form of energy or mass may be changed into another, but the total cannot be increased or decreased. This was an incredible discovery that once and for all confirmed what the Bible said 1,450 years before Christ. Shortly after that, they realized that though mass and energy remain constant, they are constantly decaying. The Bible states this in Isaiah 51:6, Psalms 102:26, and Hebrews 1:1. But it was not until the 1800's that the Second Law of Thermodynamics--the Law of Entropy--confirmed it with science. It was found that there is a constant amount of energy in the universe, but in all kinds of energy transferences there is a loss of useful energy. For example, in creating heat, the sun is diminishing at the rate of 4,600,000 tons per second! And it is not just the sun; the Law of Entropy says all things are growing older, wearing out, running down, and decaying. The Bible knew that thousands of years ago. There are a number of theories, but the Bible says it was made out of nothing which appears. In other words, it was made out of things that are invisible (Hebrews 11:3). It wasn't until approximately 100 years ago that W.C. Roentgen discovered the X-ray and in the 1920's when the electron microscope came into existence, that science ascertained that the universe was literally made of invisible atoms. The first chapter of Genesis tells us there are 3 divisions of created things; vv. 1-10 tell of the origin of minerals; vv. 11-13 tell of the origin of the vegetable kingdom; and vs. 20-31 tell of the origin of the animal kingdom. These were not known in any of the ancient cultures of Egypt, Greece, Asyria, or Babylonia but they were discovered by Carlous Linnaeus in modern times. It is obvious today that all mankind is of one blood, because we can donate and help one another with our blood. The Bible stated it in Acts 17:26, but science didn't concur until thousands of years later. As recently as 1775, anthropology taught that there were five incompatible races of men with different kinds of blood. It was not until 1900 that Karl Landsteiner discovered plasma and helped science understand the Common Blood Theory--that all blood was the same. The conflict between science and the Bible has been bitter, especially in the last 150 years. Most reasons for this hostility relate to what one perceives to be the nature and procedure of either domain. For many, the alleged conflict is resolved by separating the two spheres entirely. This is sometimes done by limiting the role of religion or the Bible to matters of faith and science to matters of fact. Specifically, some Christians in science argue that the Bible tells us �Who and Why� (God), and science deals with �How.� However, this neat separation of the domains of science and the Bible is unsatisfactory since the Bible does not so limit itself to questions of Who and Why. It often makes assertions of fact about the scientific world. Neither does science limit itself merely to questions of How. Biblical theology involves human understanding of the biblical text. As such, it is subject to misunderstanding and error. Likewise, science is fallible human attempts at understanding the universe. So conflict is inevitable. For example, most scientists believe the universe is billions of years old. Some Bible scholars hold that it is only thousands of years old. Obviously, both cannot be right. Before areas of specific conflicts are noticed, several guidelines are useful to the nature and procedure of both disciplines. Either Group Is Subject to Error. Informed persons from both sides, both Bible interpreters and scientists, have made mistakes. Many Bible scholars once believed the sun revolved around the earth (as did many scientists); some believed the earth to be square. But they were wrong. Likewise, the model of an eternal cosmos has been discarded in favor of the big bang model. Evolutionary theories about inheriting acquired characteristics have been overthrown. Either Group Is Subject to Correction Another important principle is that both areas are subject to correction by the other. For example, scientific fact has refuted the flat-earth theory. Hence, any interpretation that takes verses about the �four corners of the earth� as literal depictions of geography are wrong. Science has proven them wrong. Likewise, scientists who insist that the universe is eternal hold a theory that has been proven false, both by science and in critiques by Christians. Not all conflicts are so easily resolved. Very few things are proven with certainty in science. Some things are only probable or highly probable. For example, that the earth moves around the sun is not absolutely proven. This theory fits the facts as they are known and is a highly probable scientific interpretation of Nature that conflicts with a disputable interpretation of Scripture, then we should assume the latter is wrong. And vice versa. For example, macro-evolution is disputable and the creation of the universe, first life, and new life forms is highly probable. Hence, creation should be accepted as true and macro-evolution rejected. The Bible Is Not a Science Textbook. One principle that some overzealous Christian apologists sometimes forget is that, while the Bible makes no scientific mistakes, neither is it a science textbook. It does not speak in technical scientific terms nor with precision. It uses round numbers. It employs observational, rather than astronomical, language. The Bible only affirms partial truths in the various areas of science. It does not teach much geometry, any algebra, or trigonometry. One cannot assume conflicts without taking these factors into consideration. 2. It conflicts with an interpretation of Scripture that is beyond all doubt. For example, it is beyond any reasonable doubt that the Bible teaches that a theistic God exists. Hence, one would have to prove that it was a scientific fact beyond all uncertainty that God did not exist in order to show a real conflict. It is unlikely that real conflicts between science and the Bible will ever be demonstrated. Some apparent conflicts deserve note, along with some probable and even highly probable views of modern science that find an amazing parallel in the Bible. It is to these that we first turn. Given that not much scientific information was known in Bible times, the Bible speaks with considerable scientific credibility, an evidence of its supernatural nature. The very first verse of the Bible proclaims that �in the beginning God created the heavens and the earth.� It was common in ancient views to consider the universe eternal, yet the Bible taught that it had a beginning. This is precisely what most scientists now believe in accepting the Big Bang theory. Agnostic astrophysicist Robert Jastrow wrote that �three lines of evidence�the motions of the galaxies, the laws of thermodynamics, and the life story of the stars�pointed to one conclusion: All indicated that the Universe had a beginning� (God and the Astronomers, 111). Genesis 1 also indicates a progressive creation, universe, followed by formless earth, followed by what happened to give form to the earth. This is a much more scientifically sophisticated conception than held by the common ancient creation story. The Bible affirms that God said in the beginning, �Let there be light. And there was light� (Gen. 1:3). Jastrow wrote of the parallel of this statement with modern science, �the details differ, but the essential elements in the astronomical and biblical accounts of Genesis are the same: the chain of events leading to man commence suddenly and sharply at a definite moment in time, in a flash of light and energy� (ibid., 14). The Bible declared from the beginning that creation is complete. God rested from his work (Gen. 2:2) and is still at rest (Heb. 4:4f.). In short, no new matter (energy) is coming into existence. This is precisely what the First Law of Thermodynamics declares, namely, that the amount of actual energy in the universe remains constant. According to the second law of thermodynamics, the universe is running out of useable energy. It is literally growing old. This is precisely what the Psalmist said: �In the beginning you laid the foundations of the earth, and the heavens are the work of your hands. They will perish, but you remain; like clothing you will change them and they will be discarded� (Ps. 102:25�27). Genesis declares that life first appeared in the sea (Gen. 1:21), and only later on land (1:26�27). This accords with the view that multicellular life teamed in the Cambrian waters before it multiplied on land. Life produces after its kind. In Genesis 1:24 God said, �Let the land produce living creatures according to their kinds: livestock, creatures that move along the ground, and wild animals, each according to its kind.� According to agnostic paleontologist Stephen Jay Gould, �Most species exhibit no directional change during their tenure on earth. They appear in the fossil record looking much the same as when they disappear; morphological change is usually limited and directionless� (Gould, �Evolution�s Erratic Pace,� 13�14). In that fossil record, as in Genesis, human beings were the last to appear. Unlike ancient myths or the Qur�an, which claims that humans were made from a �clot of congealed blood� (see Sura 23:14), the Bible states that �the Lord God formed the man from the dust of the ground and breathed into his nostrils the breath of life, and the man became a living being� (Gen. 2:7). Further, it adds, �By the sweat of your brow you will eat your food until you return to the ground, since from it you were taken; for dust you are and to dust you will return� (Gen. 3:19). According to science, the constituent elements of the human body are the same as those found in the earth. Water returns to its source. Scripture affirms that �All streams flow into the sea, yet the sea is never full. To the place the streams come from, there they return again� (Eccles. 1:7; cf. Job 37:16). While the author may not have been aware of the exact process of evaporation, condensation, and precipitation, his description is in perfect harmony with these processes. Isaiah spoke of God who �sits enthroned above the circle of the earth� (40:22). This is a remarkably accurate description for an eighth-century b.c. prophet (see Isaiah, Deuteronomy). And Solomon had given the same truth in the tenth-century b.c. (Prov.8:27). In an era when it was common to believe the sky was a solid dome, the Bible accurately speaks of God spreading out the northern skies over empty space and suspending the earth over nothing (Job 26:7). The Bible is not only compatible with true scientific findings, but it anticipated many of them. Scientific knowledge is compatible with the truths of Scripture. Many other things discovered by modern science were stated in the Bible hundreds and even thousands of years in advance. These include the fact that: (1) the sea has paths and channels (2 Sam. 22:16; Ps. 8:8; Prov. 8:28); (2) the sea has boundaries (Prov. 8:29); (3) life is in the blood (Lev. 17:11); (4) disease can be spread by physical contact (Lev. 13). Geisler, N. L. 1999. Baker encyclopedia of Christian apologetics. Baker reference library . Baker Books: Grand Rapids, Mich.
Can the Bible be Trusted in Science and History? Some have suggested that Scripture can always be trusted on moral matters, but it is not always correct on historical matters. They rely on it in the spiritual domain, but not in the sphere of science. If true, however, this would render the Bible ineffective as a divine authority, since the spiritual is often inextricably interwoven with the historical and scientific. A close examination of Scripture reveals that the scientific (factual) and spiritual truths of Scripture are often inseparable. For example, one cannot separate the spiritual truth of Christ�s resurrection from the fact that His body permanently vacated the tomb and later physically appeared (Matt. 28:6; 1 Cor. 15:13�19). Likewise, if Jesus was not born of a biological virgin, then He is no different from the rest of the human race on whom the stigma of Adam�s sin rests (Rom. 5:12). Likewise, the death of Christ for our sins cannot be detached from His shedding literal blood on the cross, for �without shedding of blood there is no remission� (Heb. 9:22). And Adam�s existence and fall cannot be a myth. If there were no literal Adam and no actual fall, then the spiritual teaching about inherited sin and eventual or physical death are wrong (Rom.5:12). Historical reality and the theological doctrine stand or fall together. Also, the doctrine of the Incarnation is inseparable from the historical truth about Jesus of Nazareth (John 1:1, 14). Further, Jesus� moral teaching about marriage was based on His teaching about God�s joining a literal Adam and Eve together in marriage (Matt. 19:4�5). In each of these cases the moral or theological teaching is devoid of its meaning apart from the historical or factual event. If one denies that the literal space-time event occurred, then there is no basis for believing the scriptural doctrine built upon it. Jesus often directly compared OT events with important spiritual truths, such as His death and resurrection which were related to Jonah and the great fish (Matt. 12:40). Or, His second coming as compared to the days of Noah (Matt. 24:37�39). Both the occasion and the manner of that comparison make it clear that Jesus was affirming the historicity of those OT events. Indeed, Jesus asserted to Nicodemus, �If I told you earthly things and you do not believe, how will you believe if I tell you heavenly things?� (John 3:12) In short, if the Bible does not speak truthfully about the physical world, then it cannot be trusted when it speaks about the spiritual world. The two are intimately related. Inspiration includes not only all that the Bible explicitly teaches, but also everything the Bible touches. This is true whether the Bible is touching upon history, science, or mathematics. Whatever the Bible declares, is true�whether it is a major point or a minor point. The Bible is God�s Word, and God does not deviate from the truth in any point. All the parts are as true as the whole that they comprise. Here is another evaluation of the early manuscripts by Ellis Skolfield. Provided by the site "Behold the Beast"
We have similar textual support for the authenticity of the Old Testament. Until a few years ago, the earliest documents we had for the Old Testament were later copies of a 70 B.C. Septuigent in Greek and a Massoretic Text in Hebrew that could be positively dated to the ninth century A.D.. However, with manuscript discoveries at Qumran made in the late 1940's (the Isaiah scroll, the book of Daniel, the book of Jubilees, the Temple scrolls, etc. etc. ), some of which could be dated to the third century B.C.. Internal evidence within one Daniel scroll dates it at 350 B.C. As a result, we can now state with some certainty that there has been no tampering with the canonical Old Testament manuscripts between 300 B.C. and 900 A.D.. Despite the span of over a thousand years, the canonical manuscripts are virtually identical !!!! To suggest there was tampering to the Old Testament documents prior to 300 B.C. shows a misunderstanding of Israelite scribal methodology and of their reverence for the Scriptures. First of all, biblical scrolls were written on the inside only to prevent any smudging or smearing that might lead to a misreading of the text. When being copied -- besides many parallel readings -- the copy was compared with the original in every way humanly possible. The words in each column were counted and then the letters. The first, last, and middle letter and word in each column had to be identical to the original. If the number of words or the number of letters of the copy differed from the original, the copy was destroyed. Then they counted the words and letters in the whole document. They divided the document into quarters and into eighths. The first, last and middle letter in each section had to be the same. The number of words and the number of letters in each section had to be the same. The middle word and the middle letter in each section had to be the same, and they had to be the same for the whole document. If not, the copy was destroyed. Not corrected, but destroyed! Ellis Skolfield http://www.ellisskolfield.com The bible spans a period from Moses in about 1446 BC, to the book of Revelation, written around the end of the first century. Over that period mankind developed from desert dwelling nomads, to advanced nations that could follow religious law, as well as secular laws of kings and emperors. It is important to note that parts of the Old Testament are purely historical record, that in no way imply God's tacit approval, of what was recorded of those events. These portions simply chronicle events that took place. In spite of it's near 1600 year history, and the large volume of prophets, and legions of witnesses, God's Word requires no abrogation. It should be apparent that the Quran�s voluminous abrogation, required for a record of recitations of an illiterate, that were collected over the brief span of just 23 years, demonstrates not divine revelation, but the changing whims of it's author. A good example is the convenient "revelation" that allowed Mohammed to take his stepson's wife (Sura 33:37), or allowed him all the wives he wanted, but only for him. The Al-Nasikh wal-Mansoukh - the abrogator and the abrogated - is the Arabic language book that details what is abrogated by what. More on abrogation.